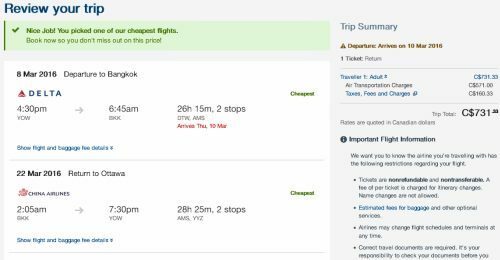 Ottawa to Bangkok, Thailand - $731 CAD roundtrip including taxes | new record! 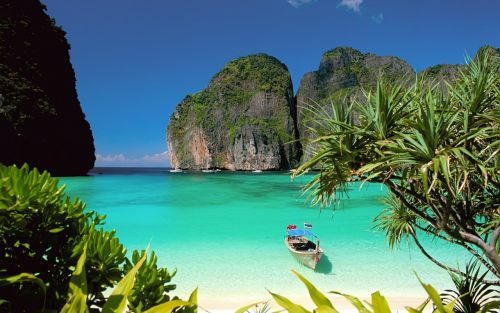 There appears to be some flights from Ottawa to Bangkok, Thailand available for an incredible price of $731 CAD roundtrip including taxes for winter 2016 travel. This is also a new record for the lowest recorded price between Ottawa and Thailand. January, February and March 2016. The following AirBNB links will lead you to some great deals on places to stay in Thailand for under $48 CAD/night for 2 people. ottawa, yow, flight deals, asia, bangkok, thailand, bkk, southeast asia, klm and china airlines. 8 Responses to "Ottawa to Bangkok, Thailand - $731 CAD roundtrip including taxes | new record!" Tried it and worked with Mar 1-15. Hello Thailand! Feb 1st to March 1st works too, east fly with KLM. Excellent! Have a great time in Thailand Anthony and Nena! Damn...seems like the deal is gone. Should have booked right away! What are the odds of this sale coming back? Kicking myself for not getting it this weekend!! This one was actually around for a while by amazing deal standards. Hopefully it comes back again!